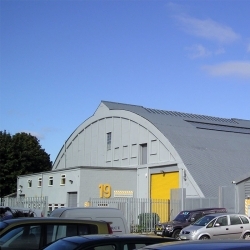 Plastisol cladding is a protective and decorative outer cover for large commercial and industrial properties. 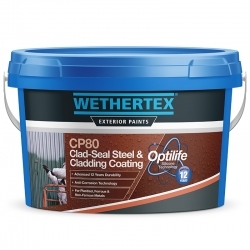 These cladding panels require regular maintenance checks when in corrosive, UV exposed and harsh weather climates, but with the right primers and topcoats can be protected for up-to fifteen years. Cladding materials are usually metal – commonly aluminium or steel – with Plastisol cladding becoming more popular in recent years. Occasionally (incorrectly at that) referred to as plastic cladding, Plastisol metal cladding consists of polyvinyl chloride particles in an emulsion, heated to form a solid and stable substrate. Visually striking in its freshly coated finish, if un-maintained, it can discolour, chalk and degrade through exposure over time. Tor Raincoat APA (RC353) is a single pack coating based on a specially modified acrylic resin system containing anti-corrosive pigments and inert extenders. Tor Raincoat APA is an adhesion promoting and anti corrosive intermediate coating for use in conjunction with Raincoat roof coatings and cladding finishes over PVDF and other plastic coated substrates. 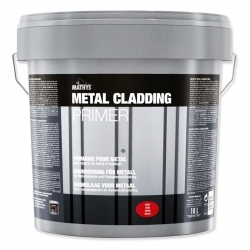 A specially formulated cladding maintenance coating to economically refresh aged, existing metal cladding. When damaged, the Plastisol coating can ‘come away’ or split from the underlying metal cladding. This can allow moisture and water particles to enter the newly exposed areas and cause rust. Damaged Plastisol cladding is not only an eyesore, but if left to degrade, it can be expensive to repair – whole panels may need replacing rather than simple maintenance repair work in the initial stages. To avoid any negative effects to the integrity of Plastisol cladding, a fantastic range of cladding paints are available here at Rawlins Paints. Refurbishing aged, cracked and weathered Plastisol cladding couldn’t be easier in 2017, and with the right primer for particularly corroded areas, these panels can look like new again. This can be extremely important to large commercial buildings, offices and schools, where the visual décor and appearance may be used a lot in promotional materials and for online marketing. To recoat and refinish Plastisol cladding is obviously cheaper and much more cost effective than replacing it – and if the correct surface preparation methods are used when treating damaged areas, any edges which have failed (and the top coating is breaking away from the metal cladding underneath) can be quickly restored. 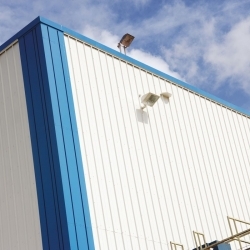 Many businesses and facilities can be kept open whilst the outer cladding is repaired or recoated by brush, roller or spray for larger surface areas. 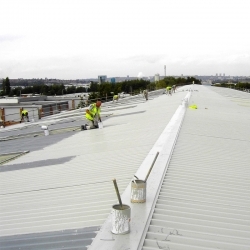 So, with our no-downtime Plastisol cladding paints and maintenance products, old water-damaged roof or side panel cladding can quickly be restored. The cladding paints available here also offer superb UV protection, protecting against any further colour fading from exposure to the sun. Rapid dry and high performing one-coats are available, with full application methods and drying times covered in the accompanying data-sheets. For further technical and sales support when buying Plastisol cladding paints, please contact Rawlins Paints and we will be able to help recommend the best product dependant on your requirements.